In this altar I have used the traditional elements of the Festival of Pure Brightness. My father took a picture of me and our extended family at a Ching Ming meeting in Honolulu years ago. While at this particular event, I couldn’t resist photographing the juxtaposing humor of the burning barrel where we burned hell money and fire crackers expediting it all to heaven to our ancestors with the residue of VP motorcycle racing fuel. 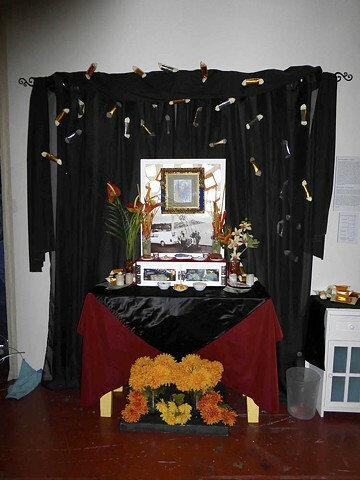 On a Dia de Los Muertos altar one will find the deceased’s favorite items. A medicine cabinet with a similar compartment to his serves as an untraditional altar. The cabinet frames the image of my father as a young man, as well as the very last time I saw him. It also conveniently holds his favorite and personal effects, his music and his vices. My siblings and I offered him to move to the mainland several times and each time he refused. He loved Honolulu. He was an amateur photographer and walked everywhere in that city and photographed it repeatedly throughout many, many years. Looking at his photos, I saw Honolulu change through his eyes from the late 70’s to two months before his passing in April 2004. I included tiki mugs and hula girls on high ball glasses to honor his favorite pastime in the various Honolulu lounges. Cheers Dad!